After a sold out Edinburgh Fringe run, A Hero Of Our Time comes to London's Arcola Theatre for 4 weeks only! A Hero Of Our Own tickets are now available to the Arcola Theatre run of this Edinburgh Fringe sell out adaption! Our antihero Pechorin is resting in a boring town and attempts to fill his days by vying with his rival Grushnitsky for the heart of young princess Mary. In the mind of a soldier, even pubs and parties can become war zones. 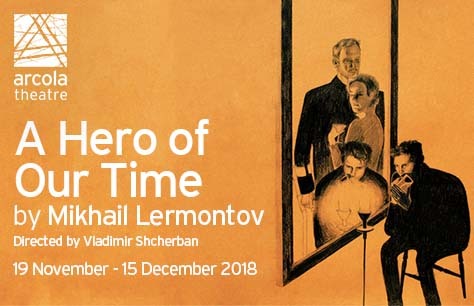 Based on Mikhail Lermontov’s 1840 novel, A Hero Of Our Time, this stunning new adaption blurs the lines between the past and present. A cutting commentary on the cruelty and complexity of games played in the name of love this show brings intimate thoughts into stark focus and follows what happens when the games we play become increasingly calculating and cruel. Following a sell-out run at the Edinburgh Fringe Festival, A Hero Of Our Time comes to London’s Arcola Theatre for a limited four week run. Book tickets to A Hero Of Our Own now, as they are extremely limited and you’ll want to secure the best seats at the best prices. This production contains strong language, smoking, loud noises and sexual references.